"This is the book of Asher Stiefel/1897/Pokitilov." hallmarked as silver made in Poland in 1858. 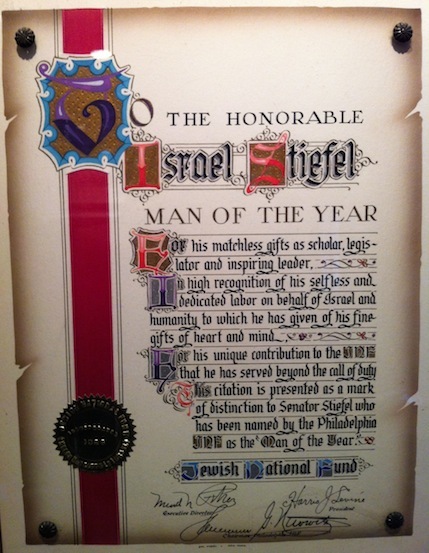 Jewish National Fund "Man of the Year" award to Israel Stiefel in 1958. Asher STIEFEL II, born in Pokatilovo, was cut down by Cossacks, in 1921. Asher II, named for his grandfather, is shown photographed in Uman as a child. The gaunt group photograph with his parents, Jacob and Ethel (Pasternak) Stiefel and his adopted sister Rosa, taken c. 1919-1921 in the Ukraine, exhibits the privations they suffered in that period of civil strife. The engraved shell memorializes Asher II, who was cut down by the Cossacks, in 1921. Later that year, Jacob, Ethel and Rosa (later called Shoshana/Suzanne) escaped to Tel Aviv, where they joined Israel Stiefel, the eldest child. Israel had emigrated to Palestine in December, 1919, aboard the ship Ruslan as part of the Third Aliyah. He served as a Haganah commander at Hulda and Gedera. After graduation from the Hebrew Teachers Seminary in Jerusalem, Israel left for Philadelphia in 1923 to continue his studies at the University of Pennsylvania. In 1929, upon Jacob's death, Ethel and Shoshana joined Israel in Philadelphia.